Charlee Bear was developed to enhance the wonderful relationship between dogs and people. Each Charlee Bear Treat is a way to say "I love you" and make the bond grow deeper. We also wanted to keep dogs healthy and lean so Charlee Bear was developed as a low calorie treat. We always used simple natural ingredients. Dogs are family and training is like teaching our children manners. Over the years Charlee Bear Treats have been a wonderful training tool helping many doggies to be well mannered canine citizens. At Charlee Bear we are so proud of the moments of love and fun that our treats have helped to create over the past 25 years. Items may not be sold on third party e-commerce sites (such as Amazon, eBay, Jet, etc) without prior authorization from MANUFACTURER. 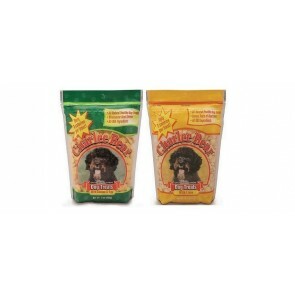 Charlee Bear Dog Treats 6 oz. For some products we carry, you will be able to select variations based on attributes such as color, size or flavor. To streamline your ordering process, you can use the matrix below to order one or multiple versions of a particular product using the attributes listed. What are your top holiday needs?